As Iranian opposition reveals secret nuke research, EU's foreign policy chief announces meeting with Iranian Foreign Minister. 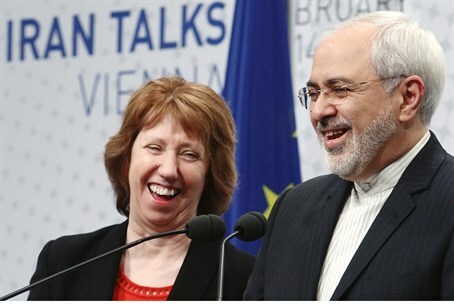 The European Union's foreign policy chief Catherine Ashton will meet Iranian Foreign Minister Mohammad Javad Zarif in Vienna on October 14, Reuters reported Wednesday. The two will be joined the next day by U.S. Secretary of State John Kerry, the EU said in a statement. Iran and major powers are seeking to settle a dispute over Tehran's nuclear work by a November 24 deadline, which was set after the sides failed to meet an earlier July 20 target date for an agreement. The talks have been stalled for months over Iran's opposition to sharply reducing the size and output of centrifuges that can enrich uranium both to levels needed for reactor fuel or the core of nuclear warheads. Iran says its enrichment program is only for peaceful purposes, but Washington fears it could be used to make a bomb. The Islamic Republic has been taking an increasingly aggressive line in demanding its "right" to enrich uranium, with Iranian Supreme Leader Ayatollah Ali Khamenei recently saying Iran "needs" 19 times more nuclear centrifuges than the amount being offered by world powers. Kerry met recently with Zarif, as the last round of nuclear talks between Iran and six world powers - the United States, Russia, China, Britain, France and Germany - was going on. Reports of next week’s meeting come as members of an Iranian opposition movement revealed that the Islamic regime is continuing its nuclear weapon research at a secret location. According to the Iranian resistance movement in exile Mujahedin-e Khalk, also known as MEK, Tehran is developing nuclear weapons after having relocated its research facilities to avoid detection.